Just 6 kilometers from its inception point, the Narmada River falls down a height of almost 100 feet to get its first waterfall – the Kapil Dhara. The location of this scenic waterfall is absolutely stunning with its green forest canopy, hilly terrain and tranquil atmosphere. 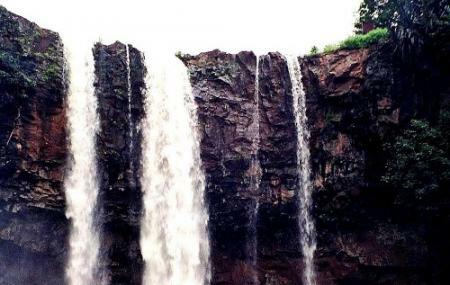 That is why many consider this waterfall to be a gem of MP Tourism. As two more rivers, Kapila and Erandi, merge into the Narmada before forming the falls, some people often have the question that Kapildhara Falls is located on which river, but the main river is Narmada itself. The waterfall is named after the famous Kapil Muni (sage) who is said to have meditated and attained divinity at this very spot. Wear comfortable shoes with a good grip as the terrain can become quite slippery. It is best visited in the monsoon season as the water level is higher during those months. Please ask locally for ticket prices of Kapil Dhara Waterfall. How popular is Kapil Dhara Waterfall? People normally club together Kabir Chabutra and Dudh Dhara while planning their visit to Kapil Dhara Waterfall.